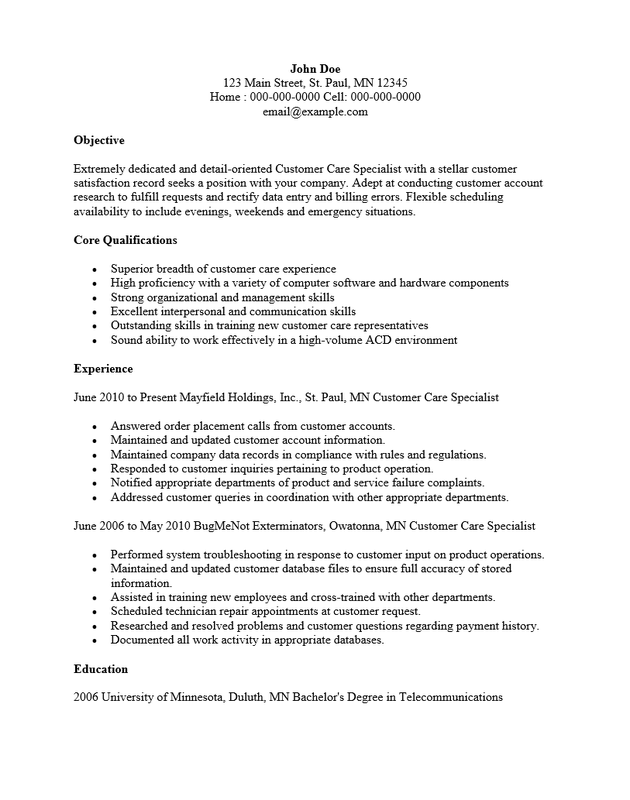 The Customer Service Specialist Resume Template is geared towards aiding customer service specialists in gaining an interview with a recruiter for a job position the candidate feels is a good fit for them. The competitive nature of today’s market requires that applicants be on top of their game when reaching out to potential employers as they present themselves. Customer Service Specialists must be able to display their ability to use language effectively and a resume template will be able to free a job seeker from troublesome formatting issues while enabling them to focus on everything from sentence structure to vocabulary. A well written resume results in an applicant to standing out among the rest, which is ideal when a recruiter reviews this document. It is crucial the initial contact a candidate makes with a recruiter through a resume results in a positive impression. This document is likely to be a key decision factor when a recruiter decides whether or not to interview the candidate. 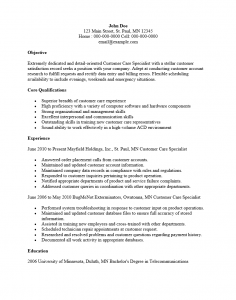 The Customer Service Specialist Resume will provide a structural framework for this self-presentation in a sleek and polished manner. Step 1. Fill out the Name and Contact Information. This is located at the top of the page, usually in the center. The Name will go on the first line and the address, phone number, and email will go on the following lines. Step 2. In the Objective Section, write one to five sentences stating your intention in gaining the desired position and how you envision your skills will benefit the company being applied to. Step 3. Write a brief synopsis describing your professional attitude, skills, and the benefits that may accompany hiring you. Step 5. If you have a history in a professional setting, this should be reported in “Experience.” Each entry should be the name of the establishment where some function was served for pay or otherwise. The first line should include the name, location, official title, and the dates you were there. Below this include a list of the functions or accomplishments that were achieved while in this position. Step 6. In “Education,” report all institutions attended starting with the most recent. Each entry here should include the Name of the Institution, Location, Certificate/Diploma earned, and dates attended. If the coursework directly relates to being a customer service specialist in a concrete way include this as well.